An SEO campaign can be distilled into two different categories: on-page and off-page. While different from one another, they are both crucial to moving the needle and seeing results. On-page SEO refers to optimizing individual pages of your website. Off-page SEO tackles factors outside of your website that can affect rankings. Unique title tags, meta descriptions, and H1s are crucial when it comes to informing Google and searchers what your page is about. It also helps improve click-through-rate as meta descriptions serve as compelling copy for potential customers. The following is Victorious’ search result for the term ‘SEO Company San Francisco’. Put the keywords you’re targeting in your title tag and meta description. The more important a keyword is the closer it should be to the front of the title. Make sure to conserve space as title tags are limited by a 568 pixel width not a character length. If they’re too long, they will be cut off and searchers will not be able to see valuable information which can affect CTR. You can use Moz’s title tag tool to see how it would appear on Google. For meta descriptions, make them enticing, informative, and relevant. Include important keywords as Google will highlight ones that match the searched term. However, don’t keyword stuff as that can deter people from clicking on your link. Additionally, keep them under 160 characters or like title tags, they will get cut short by Google. SEOmofo’s SERP Snippet Optimization Tool lets you preview meta descriptions. H1s are typically the largest text on a page and act as a title. 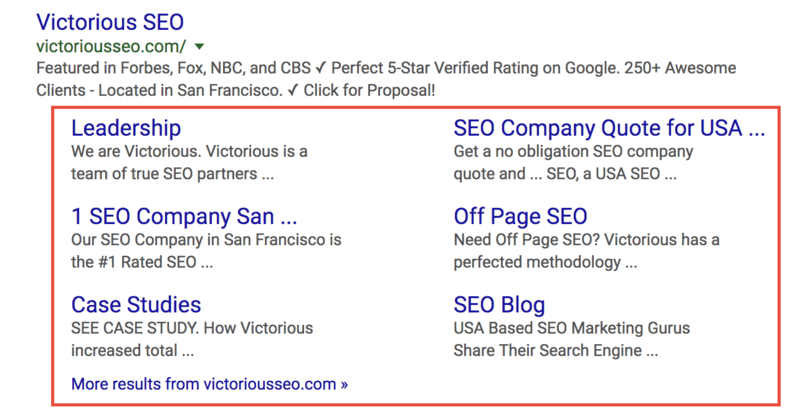 A page discussing a SEO company in San Francisco would have a title that accurately reflects the content such as, ‘Looking for a SEO Company in San Francisco?’ H1s should include the target keywords and be relevant to the copy of the page. Keep them between 20-70 characters. Although it’s not a hard rule, if H1s are too short, you’re wasting an opportunity to further optimize your page. If they’re too long, they can hurt the user experience. Updating metadata is the fastest way to see SEO results. 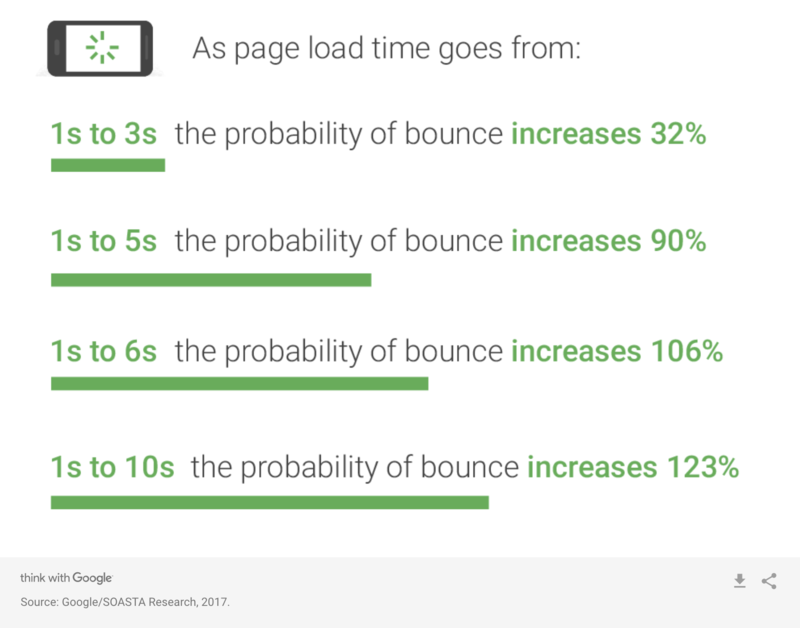 A study by Google in 2017 revealed that bounce rate increases 32% when a mobile page load speed goes from one to three seconds. Below is a chart from the study. Since user-engagement metrics are a factor that Google considers when ranking websites, a high bounce rate may result in a decrease in organic rankings and visibility. You can run a Google PageSpeed Insights test to see what elements of your website need optimizations to increase site speed. Good content is the backbone of on-page SEO. In fact, a 2017 survey by BrightEdge revealed that 97% of digital marketers agree that SEO and content marketing are converging or have already converged. However, not all content will drive traffic. You have to create high quality content that targets long-tail keywords. In addition to targeting high intent keywords, make sure that it’s easy and interesting to read, answers the reader’s questions, is valuable and easy to share. Avoid publishing duplicate content as search engines are good at detecting and penalizing websites that practice spammy techniques. There are content checklists for SEO that you can reference when crafting your strategy. Helps search engines understand your site structure and navigation. Choose and show aggregate review ratings to establish trust with searchers. A crucial step in establishing your authority is crafting an effective link building strategy. Link building simply put is the process of acquiring links from other websites. Search engine crawlers use these links to crawl from website to website. They also serve as a vote of confidence from the linking site to the linked site. The more ‘votes’ a website has, the more authoritative it appears to Google, therefore, the higher likelihood it has to rank well. Here is an article on several link building tools and how to use them. Citations are a great off-page SEO tactic to boost local rankings. It involves having your NAP (business name, address, phone number) accurately listed on other high authority websites such as the YellowPages or Yelp. They serve to validate your business as trustworthy. When it comes to citations, the more the merrier. Just make sure that they’re listed on high authority websites that are related to your industry and location. Additionally, your NAP format must stay consistent with the one listed on your Google My Business listing. Social media allows companies to increase their presence and interact with followers through sharing content. It’s also an easy way for people unfamiliar with your brand to find and build your online following. Additionally, search engine crawlers can crawl social media posts (although limited) and index the links included, which can affect your ranks. Overall, it’s a great way to establish a reputable online presence and to legitimize your business.